Generally associated with plastic and wooden 55 gallon drums covered with slimy moss, rainwater harvesting just doesn’t seem to capture the imagination like an exotic green roof or a gleaming solar array — until now. 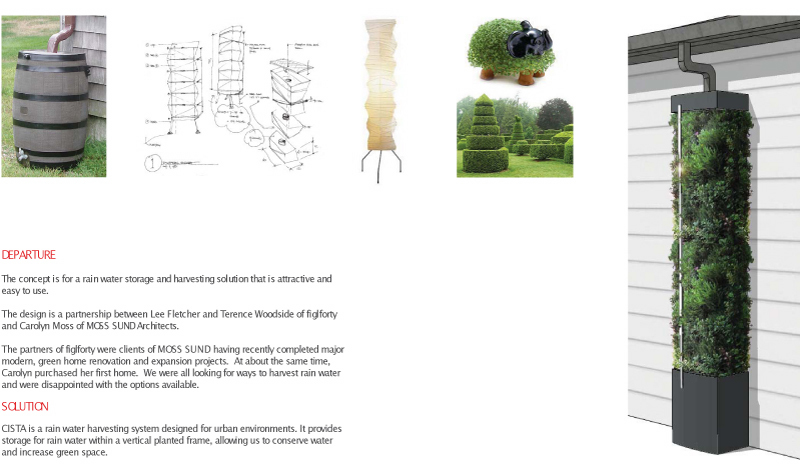 The CISTA rainwater harvesting system (which we just spotted on Kohler’s new H2OVisions website) is a dramatic, elegant and space-saving solution for the urban environment that conserves water, increases green space and just might finally bring rainwater harvesting the kind of attention it deserves. Rainwater harvesting is one of the easiest and most practical things homeowners can do for the environment. It saves on the water bill, eases the load on the local watershed, and can help keep that ecologically friendly landscaping looking fresh and healthy. 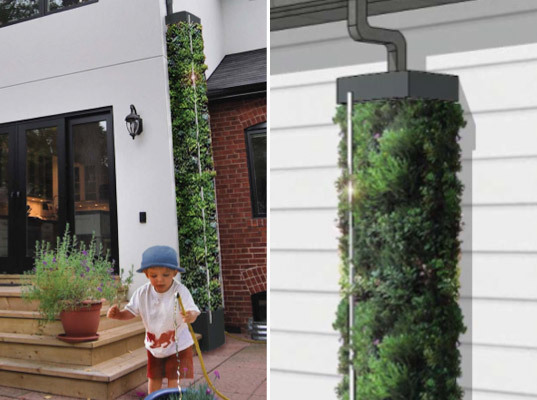 We’ve covered rainwater harvesting solutions before, but this is the coolest rainwater harvesting system we’ve seen yet — the CISTA is a beautiful space-saving rain water harvesting system designed for urban environments. A collaboration between architects MOSS SUND and industrial designers figforty, the CISTA is an 8-foot stainless steel column that acts as a kind of planted downspout. It can collect up to 100 gallons of water at a time, creating enough water pressure to operate a soaker hose housed in a storage compartment at the base of the unit. A climbing plant like ivy is planted at the base and naturally winds its way up into the frame. The LED water-level indicator lets you know if the CISTA needs a little help, the system can be expanded both horizontally and vertically, and thanks to its nesting design it can be efficiently shipped. Where can I purchase the cista water system? That is a very beautiful harvesting system. I agree that it is a vary good thing for homeowners to do. Especially in areas where it doesn't rain as much. It is helpful to have a tank that can water your lawn and help save on the water bill. They are not quite as pretty but I found some space saving tanks at bushmanusa.com and they are much more affordable. If it's affordable, then it should do well. Generally associated with plastic and wooden 55 gallon drums covered with slimy moss, rainwater harvesting just doesn't seem to capture the imagination like an exotic green roof or a gleaming solar array -- until now. The CISTA rainwater harvesting system (which we just spotted on Kohler's new H2OVisions website) is a dramatic, elegant and space-saving solution for the urban environment that conserves water, increases green space and just might finally bring rainwater harvesting the kind of attention it deserves.